The Monkees was the sitcom about a pop band where the actors became an actual pop band: member Micky Dolenz said it was like Star Trek's Leonard Nimoy becoming a real Vulcan, but the spin-off albums and singles were, if anything even more successful than the TV show that spawned them. Starting in 1966, it sprawled through almost sixty adventures of wild and wacky humour and often excellent music, all tailored to a youth audience that saw it hugely popular with kids even after it went off the air in 1968 thanks to countless repeats across the world for decades. Many hands were responsible for its success, but there was only one Pre-Fab Four, the term coined to point out their debt owed to the first two films of The Beatles, A Hard Day's Night and Help!, which were plundered for the humorous, anything goes tone and the mixture of songs. But all good things had to come to an end, and so on the 2nd of May 1968 the final episode aired, allowing Dolenz his chance to write and direct his own story which he had been clamouring for. It was either titled Mijacogeo or The Frodis Caper, depending on who you talked to, and was one of the strangest half hours of American sixties television with its random tangents arranged around an ostensibly science fictional plot. "Frodis" was Monkee slang for marijuana, which they toked behind the scenes (never on the show), and saw a villainous Rip Taylor try to hypnotise the world with an alien plant's mind control signal through their TV sets. 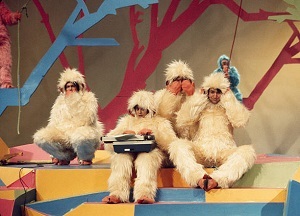 The laughs were still there, but the strong hints the boys were outgrowing their format were also present, the "Typical Monkee Romp" accompanied by an anti-war song: they had to evolve, move on. But not before two projects that were, if anything, stranger than that final, regular episode. Monkees creator Bob Rafelson had been champing at the bit to move into movies now he had proven himself on television, but there was an obstacle in his way: his big hit. The studio wanted him to make a spin-off from the television series, and he agreed, apparently on the condition he, co-screenwriter Jack Nicholson and the Monkees themselves, could approach it in any way they wanted. The results were released a couple of months after the show ended, but with a bizarre advertising campaign that was reluctant to mention the band at all, supposedly to prevent any prejudice from those who felt the boys were now passé. However, it also meant the faithful fans were left unaware their favourite band had made the movie. Head, as it was called, flopped badly, and more or less called time on the project that had seen such meteoric success for what amounted to some of the new generation in Hollywood. Yet over the years, thanks more to the lauded works of Rafelson, Nicholson and others part of that New Wave (though not so much the Monkees themselves), or possibly because something this downright peculiar was always going to find an audience no matter who had made it, it became a cult movie in the mid-seventies and never looked back. Those who loved this may not have been as numerous as those who loved The Beatles films, but they nevertheless represent a fanbase that went beyond the image of the group as teen idols and into the realms of the mind-expanding and cosmic, yet also the paranoid and in its counterculture fashion, the political. Head begins with the band running away from unseen pursuers across a bridge where officials are about to stage an opening ceremony, then Micky jumps off into the river far below whereupon he is rescued by mermaids as the imagery turns colourfully solarised: we have not had the name of the film, nor the cast or crew credited. And nor do we until the very last moment, the whole production designed to be as disorienting as possible, as it certainly stars those wacky funsters, but now they are confused, angry, scared and all sorts of other emotions that in combination would never be considered for an episode on the small screen. Not to say this wasn't funny, at times it was very much so with some great, off-kilter lines peppering the dialogue ("No one ever lends money to a man with a sense of humour! "), but it was actively weird. Rumour had it that Rafelson and Nicholson, along with their quartet of stars, had dreamt up the entire script while off their faces on psychedelic drugs, and there was certainly a druggy, hallucinatory tone to everything you saw here. But there was a philosophy too that went beyond what was commonly regarded as a takedown of the Monkees' sudden rise to fame and the whole landscape of showbiz that fostered overnight stars, and that was more of that paranoia of the age, the late sixties. While we saw screaming fans tear the clothes off the band who then appear to be dummies, satire alert, there were scenes where they fought in the Vietnam War that was raging at the time and sending young men the same age as the stars off to battle and potential death; even news footage of Vietnamese, including that street execution of infamy, was used. 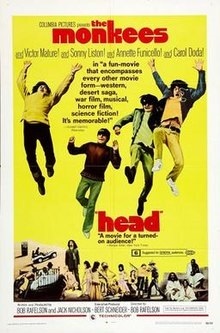 The whole unease that the peace and love mantra of the Summer of Love was curdling was everywhere in this film, so much so that Head seemed to be looking forward to a future where conspiracies ruled the media and the authorities, and the individual was left to flounder, not knowing where to turn for genuine answers to some very pressing questions. All this to a selection of terrific songs, some of them written by band members Mike Nesmith and Peter Tork (whose two contributions are truly superb), starting with the psych-pop classic Porpoise Song from Gerry Goffin and Carole King, and ending with it too. There were guest stars ranging from Victor Mature (who merely laughs at the Monkees' predicament) to Annette Funicello and Frank Zappa, Nicholson too, amounting to a relic from the hippies that tapped into an authentic bewilderment many still feel. Alas, bewildered was the feeling their last ever, original television outing left most audiences with, those who bothered to tune in, that was. 33 1/3 Revolutions Per Monkee was made after the break from Rafelson and Bert Schneider as creative guidance, and broadcast in 1969 as Monkee Mania was more or less over. They had handed the reins over to Jack Good, the British genius of rock and pop on television who essentially invented the format such music uses to this day, but his magical touch deserted him for long stretches of this: needless to say, the Monkees themselves had little praise for it, and much preferred Head as the final say on the band once the dust had settled. There was a plot of sorts, which was something to do with guest stars Brian Auger, Julie Driscoll and the Trinity taking over the world with the power of the boys' tunes. However, it appeared Good was more interested in the rock 'n' roll of the fifties, hence prominent stars like Jerry Lee Lewis, Little Richard and Fats Domino (introduced strikingly on a tier of four pianos with Auger at the top) hogging the limelight with their old hits, and the Monkees themselves barely getting a look in for long stretches of the action. When they did appear, they were given individual spots of variable quality, Mike's solo number the best, though Davy Jones gamely hoofed through a callback to Daddy's Song from Head: there, he had danced with Toni Basil, here, no such luck. The science fiction trappings were rudimentary, though the finale freakout of Listen to the Band was interesting in that it would likely have scared away any mums and dads watching, and left the kids baffled. There you had it: The Monkees had misjudged their audience. Peter left the day after broadcast, which itself had taken place the day after their last ever concert as the original foursome, and now the writing was on the wall. Over the next few months, they became a trio, a duo and lastly agreed it was over, but they did reunite in various combinations over the next decades. 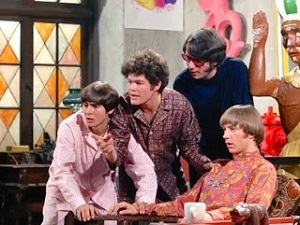 Their last major television event was 1997's Hey Hey We're The Monkees, a mild special designed to promote their Justus album notable not so much for the music, more for the loose plot that saw them still living together as a band, but reluctant to indulge in their old adventures or anything like them; not much scope for humour there. When Davy died in 2012, it signalled the very end of them: almost, as in 2016 they reunited once more with him in archive form for the album Good Times!, at last a fitting tribute and coda with some excellent, sunny songs by the original team and guest writers including Rivers Cuomo, Andy Partridge, Paul Weller and Noel Gallagher. As Head continues to find fans, and the two seasons of the show are as fresh as ever, The Monkees live on.